Washington D.C. (TADIAS) – The body of 26-year-old Olympian Meskerem Legesse, who died last week after collapsing at a restaurant in Hamden, Connecticut, has arrived in Ethiopia for burial. 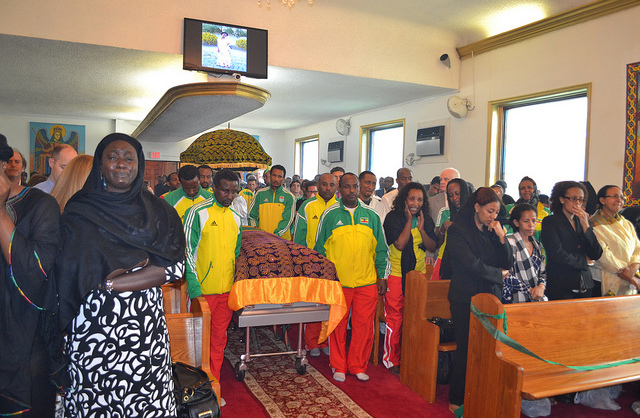 A special service had been held for the late athlete at St Mary of Zion Ethiopian Orthodox Tewahido Church in New York on Sunday, July 21st that was attended by a large number of people from the Ethiopian community, including her fellow athletes residing in the area, friends and family. Zerihun Asrat Feleke, a family member of the athlete told Tadias in a telephone conversation from South Dakota that Meskerem’s immediate family and Ethiopian athletes were at Addis Ababa International Airport to receive her body late Tuesday. “Her funeral is scheduled to be held on Wednesday at the St. Trinity church in Addis Ababa in the presence of her family and athletes as well as her supporters,” said Zerihun. He thanked the Ethiopian Diaspora community who have been extending their support to help transport Meskerem’s body to Ethiopia. “I can’t tell you with enough words how Ethiopians were cooperating to support us to move her body to Ethiopia. We, families of the late athlete Meskerem Legesse, have a great appreciation for all the Ethiopian community both here in the US and in Ethiopia,” added Zerihun. Meskerem, who was due to give birth in three weeks, is survived by her two children including her newborn whom doctors saved the same day she died. Her 2-year-old son was with his mother when she collapsed at the Chinese restaurant in Hamden. Family members told Tadias that the children will remain with their father, Meskerem’s partner. We reported last week that the former runner was initially diagnosed as having a heart problem in 2009 after she collapsed during a training session in Arizona. The same year, Meskerem suspended her athletic career, but family members say her recent pregnancy was considered to be high risk due to her heart problem. Below is a video from the New York Church service for the late Olympian Meskerem Legesse.